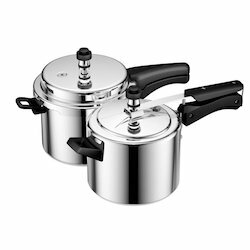 Pressure Cookers are available in Two Types. Sizes different from 1 Litre to as Big as 12 Liters. 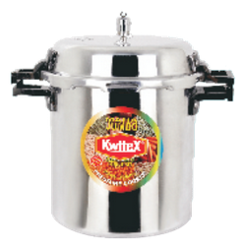 Usually used Worldwide for Cooking in Household as well as commercial cooking. 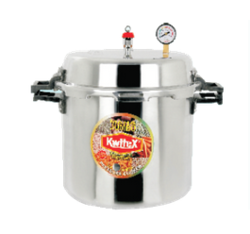 Aluminum Jumbo Pressure Cooker Outer Lid available from 11.5 LTR to 200 LTR. 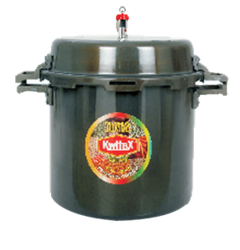 The Jumbo Cooker is useful for Small / Large Scale lnstitutions's Kitchen,Catering Services, Ram'Roti, Hostel, Canteen, Bhojanalaya, Swaminarayan & Other Religious lnstititions's Kitchen, Travelling & Cooperative Soc. Meal, Mid Day meal yojna Government Hotel, Hospital's Kitchen, Jail Kitchen, Remand Home, S.R.P. Police Training, Military Kitchen, Gurudwara, Jawhar Navoday vidyalay, Prajapita Brahma Kumari Religious lnstitutions etc. * Special Material Gasket for Long Life use. * SSI, NSIC, CE & BSCIC Certified Unit. 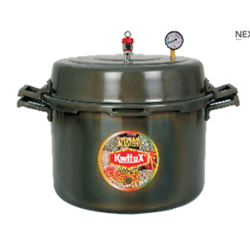 * Most economic steam cooking system for messes, catering, food to students and soilders. * FREE SPARE PARTS includes (1) Extra Gasket (2) Extra Safety Valve (3) Spanner Set (4) Safety Pin. 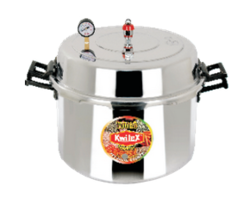 Aluminum Jumbo Pressure Cooker Outer Lid available from 11 LTR to 200 LTR. The Jumbo Cooker is useful for Small / Large Scale lnstitutions''s Kitchen,Catering Services, Ram''Roti, Hostel, Canteen, Bhojanalaya, Swaminarayan & Other Religious lnstititions''s Kitchen, Travelling & Cooperative Soc. Meal, Mid Day meal yojna Government Hotel, Hospital''s Kitchen, Jail Kitchen, Remand Home, S.R.P. Police Training, Military Kitchen, Gurudwara, Jawhar Navoday vidyalay, Prajapita Brahma Kumari Religious lnstitutions etc. Packaging Details: Each Piece With Gift Box Packing & 8 Pcs. Per Master Carton. Packaging Details: Each Piece Box Packing..